Meet your new favorite bike. Part of the new CTX series, the CTX700N offers a laid-back riding position with more forward-set hand controls and footpegs, and a low 28.3-inch seat height. The CTX700N features the fuel-efficient 670cc twin-cylinder engine in our award-winning NC700X. 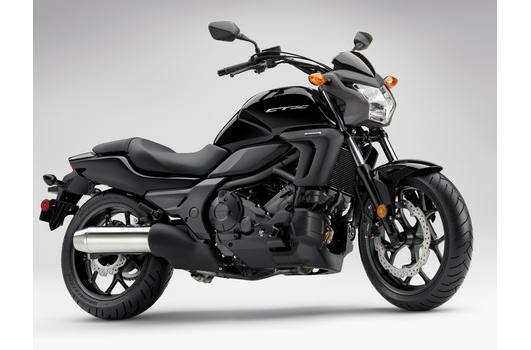 Comfortable Cruising: Honda’s new CTX series is all about making motorcycling fun and accessible. The CTX700N’s relaxed riding position and low seat help achieve this goal. Your Power Partner: The CTX700N’s 670cc liquid-cooled parallel-twin engine produces tons of torque and enough power for easy two-up cruising. Honda twins are famous for their wide powerbands and efficiency, and this new engine is one of our best. Convenient Storage: We want the new CTX700N to be a bike you’ll want to ride every day, not just on weekends. That’s why we went out of our way to design user-friendly features like the integrated storage—perfect for items you need to access fast. Make it Your Own: A wide array of accessories designed specifically for the CTX700N is available to help you get what you want out of your new ride. Best of all, they feature the same quality and durability you’ve come to expect from Honda. 670cc Parallel-Twin Engine: With its cylinders tipped 62 degrees forward for better weight distribution, the CTX700N's engine is a big step forward in modern powerplant design. The two-cylinder format produces tons of low- and mid-range torque, and the 270-degree-phase crank and uniaxial primary balancer make it smooth, too. Reduced Vibration: You don't need to rattle and shake when riding a motorcycle. The CTX700N's engine counterbalancer and rubber-mounted footpegs let you enjoy the ride on your commute or on a weekend getaway. Electronic Fuel Injection: Honda's Electronic Fuel Injection means easy startups on cold mornings and flawless running even at high elevations. 41mm Fork: With 4.2 inches of travel, the CTX700N soaks up the bumps and jolts in rough pavement, but also provides excellent handling and superior feedback through the handlebar. Front and Rear Disc Brakes: Single front and rear disc brakes give the CTX700N great stopping power. Cast Aluminum 17-inch Wheels: The 17-inch wheels give you a wide choice of premium tires to choose from and really help the CTX700N handle like a pro on the street. The cast wheels are light and strong too. Pro-Link Rear Suspension: Offering 4.3 inches of rear-wheel travel and teamed with a Honda Multi-Action System rear shock, the CTX700N eats up rough pavement while giving you a smoother ride. Diamond-Shape Steel Frame: Light, strong, and with just the right amount of stiffness, the CTX700N's rigid and compact chassis is the foundation for precise handling. Relaxed Rider Position: The CTX700N was designed for a comfortable, confidence-inspiring ride. The rider triangle was designed to provide a relaxed riding position for most riders, so you won't feel cramped up after just a few miles down the road. Low Seat Height: With a seat height of just 28.3 inches, the new CTX700N is confidence-inspiring and comfortable. Combine that with the forward-set controls, and it's easy to flat-foot it at stoplights or in parking lots. Low Center of Gravity: The CTX700N's low center of gravity makes for a more confidence inspiring, all-around riding experience. LCD Instrument Panel: Full digital LCD instrumentation includes digital speedometer, digital bar-type tachometer, clock, low-fuel gauge, and two tripmeters. The instruments are light, compact, and easy to read, too. Integrated Storage Compartment: The new CTX700N offers a convenient utility compartment that's in the fuel-tank area, making it easy to reach.